The UN General Assembly declared 2019 International Year of Indigenous Languages, with the aim of preserving an inestimable good of humanity and a fundamental right of native populations. This year the XXXIV edition of the Nosside Prize is celebrated, whose “strategic” identity – its founder and president, the historian Pasquale Amato explains – is to enhance and give voice to the multiple cultural identities of the planet, in the openness to all languages and dialects, especially those in the minority or at risk of extinction. So, let’s come all to the MArRC on Thursday, January 31st, 2019, at 5.30 pm, in the Conference Hall, for the meeting with the historian Pasquale Amato, professor at the University for Foreigners “Dante Alighieri” and head of the Global History Cycle of the International Center for Writers of the Calabria. 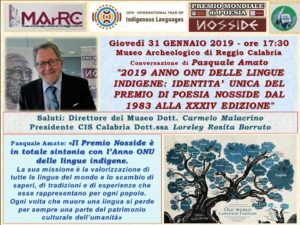 He will speak on the theme: “2019 UN Year of the indigenous languages. 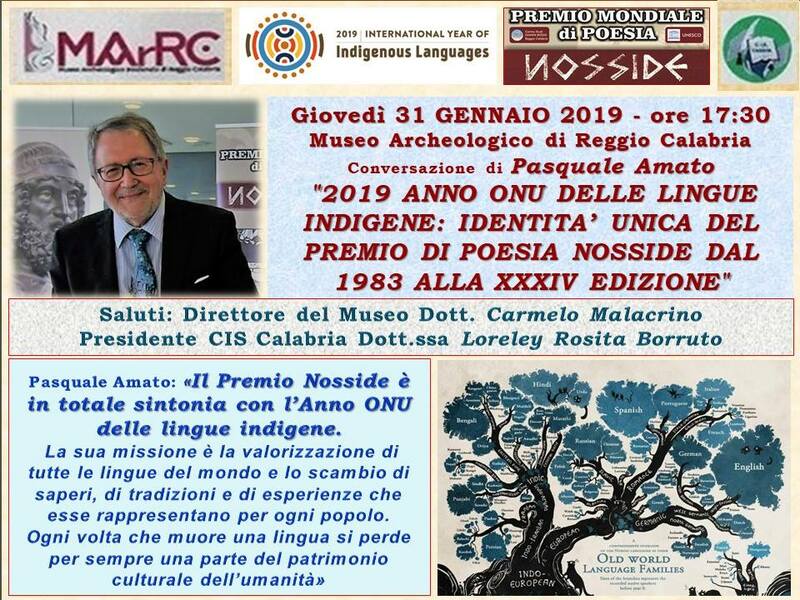 The unique identity of the Poetry Nosside Prize, from 1983 to the XXXIV edition”, in collaboration between the National Archaeological Museum of Reggio Calabria and the CIS. Speakers for the greetings: the director of the Museum Carmelo Malacrino and the president of CIS Loreley Rosita Borruto. The XXXIV edition of the Nosside Prize will be presented on Saturday 9 February at the International Book Fair of Havana (Cuba), for the 21st consecutive time. The closing ceremony will be held at the MArRC on 29 November. “Nosside is in complete harmony with the celebrations of 2019. Infact – Amato says – since its foundation in 1983, it has had the exchange between knowledge, traditions and experiences of the peoples of the Earth as its strategic identity. No other cultural project can boast such a rich heritage of poets rewarded by the five continents and in little known languages. The Nosside – the historian continues – has never given up his choice to give voice to the poets of minority ethnic groups, on the margins and boundaries of global society, preferring to the usual known many strangers, bearers of stories and cultures often at risk of extinction, enhancing the multiple identities of planetary culture”. This is a mission of civilization which the founder and president says he is “proud” of. He affirms: “We will continue along this important and precious road, in a world that is increasingly traversed by regurgitation of racial and religious hatred and by the raising of old and new walls of intolerance and oppression. Every time a language dies, a fundamental part of humanity’s cultural heritage is forever lost”.